Tests on milk and dairy products have never been so easy! Are you in charge of quality control at a milk processing factory? Do you run a dairy? Do you have a test laboratory? We have the analysis system for quality and process control that is most appropriate for your business. It is CDR FoodLab®, the analysis system for milk and dairy products that allows to determine a wide panel of parameters on milk as is and on dairy products with a prior simple preparation fine tuned by the laboratories of CDR. Solutions for Milk and Dairy products analysis was last modified: May 2nd, 2017 by CDR s.r.l. CDR FoodLab® can determine a wide panel of parameters on milk and dairy products, thus removing the need to purchase and rely on diverse systems to test the quality of milk and dairy products. What dairy products can you analyze? The CDR FoodLab® chemical analysis system to test milk and dairy products can be configured to perform analyses on eggs and egg products, vegetable and animal fats and oils, tomato and vegetable purées in general. Thanks to its ease of use, reduced testing time and reliability, CDR FoodLab® is used in the laboratories of food industries or on the production line of small and medium sized dairies to perform quality controls during any phase of the production process or upon sale/purchase of the product. In a milk processing factory, CDR FoodLab® can be used to assess thermal treatments, monitor the content in lactose or lactic acid according to law provisions. Milk producers and zootechnicians use CDR FoodLab® directly in the stable to take prompt decisions on the breeding diet and improve the animals’ health. Monitor thermal treatments of milk: CDR FoodLab®, with one single instrument, allows to determine: Alkaline phosphatase, Peroxidase and the level of e-Fructosyl-lysine (Furosine) so as to have the complete panel of tests needed to control the thermal treatment of milk. All methods have been developed by the research laboratories of CDR and have been specifically devised to maximize ease of use and reduce testing time. The “step by step” guide, displayed on the touch screen of the device, helps the operator if there is ever a doubt on the procedure. The sample is tested as is, or with a prior extremely simple preparation that is far easier than official methods. Reagents come in disposable pre-filled vials developed and produced by the research laboratories of CDR, thus removing the need to handle toxic or carcinogenic substances. The broad incubation module allows to test up to 16 samples at one time. CDR FoodLab® is a true analysis laboratory. We have developed it to perform easy and fast chemical analyses either in a laboratory, or on the production line of small dairies, food industries, milk processing factories, zootechnics consultants and firms without the support of personnel with specific lab tech experience. CDR FoodLab® guarantees reliable results for the tests performed on milk and dairy products. This measuring system owes its sensitivity, accuracy and reliability to the photometric technology based on state-of-the-art LED luminous sources. Moreover, the correlation of the test results with the reference methods ensures the reliability of each and any analysis performed with the system. Associazione Italiana Allevatori (Italian Breeders Association) : The CDR FoodLab® analysis system has been validated by the Standard Latte Laboratory as well as by other certified laboratories. 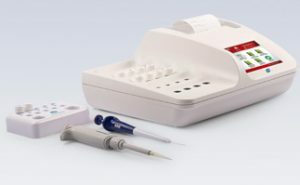 Comparative studies have given evidence that the accuracy of the results obtained with the CDR FoodLab analytical method is in line with the accuracy of the results yielded by the reference methods, while CDR FoodLab® is much easier to use and provides the requested results in reduced testing time.